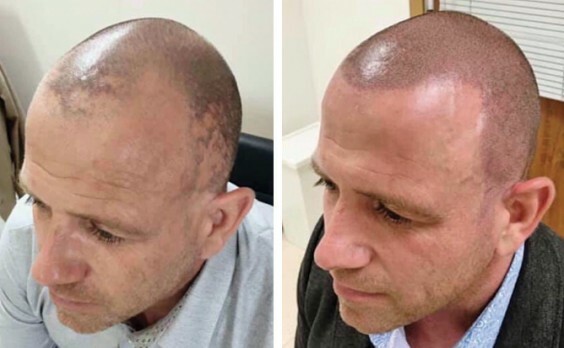 Jackie Nash, a trained cosmetic tattooist, uses scalp micropigmentation to create the appearance of a full head of shaven hair, which can help to restore confidence and a more youthful look. The pigment is implanted into the balding areas of the scalp, replicating the look of natural hair follicles. The treatment can be used at any stage of hair loss and is an instantly effective and long-lasting solution. Based at The Mill House Clinic, Jackie works closely with each individual client to create a bespoke hairline that they are happy with. The three-part treatment is carried out over a few weeks, with each session taking approximately three to four hours depending on individual requirements. Only the highest-quality equipment and pigments are used, and Jackie is fully licensed and insured and follows rigorous hygiene procedures. Jackie’s background as a trained artist means she can use her professionalism, attention to detail and artistic flair to create the most natural-looking hairlines. As part of her training, she worked with one of the leading scalp micropigmentation practitioners in the country.